Fall is finally in full-swing here in the Midwest! Even though these October temperatures have been well into the 70's, I'm completely ready to whip out the boots, scarves and jackets for the chillier months. Ladies, you can't go wrong in the fall with a pair of distressed skinny jeans, booties and a leather jacket. The recipe to success here is to rotate through your tops, scarves and boot collection to pair together all different types of looks. For this shoot, I went for a monochromatic look with black boots, jeans, a black patterned top, black leather bomber and a matching black cross-body bag. 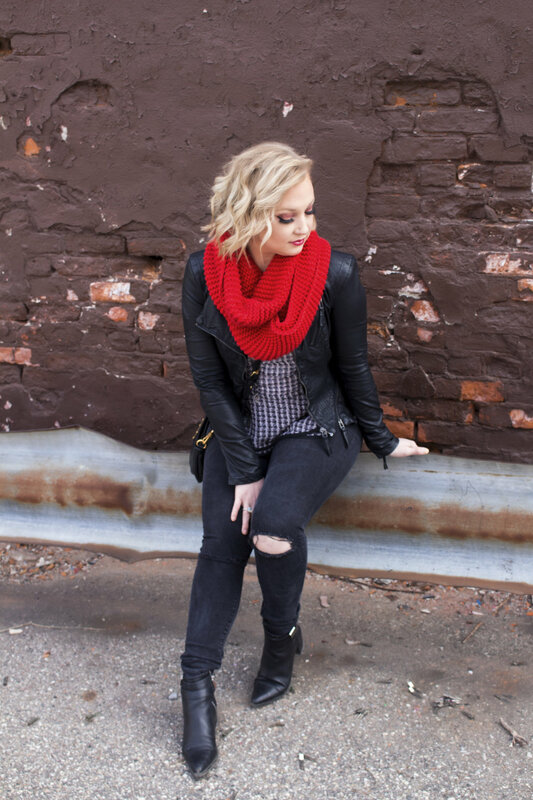 The single pop of color is the infinity scarf, which packs quite the punch with the thick red knit. This combo works well for my petite body - the black is slimming, the clothes fit tailored and show off my curves, and the head-to-toe color palette doesn't draw a ton of attention to any single body part. I can't wait to try this combination with some other pieces in my wardrobe. Even swapping out one article of clothing or accessory has the possibility to change the look dramatically! This is the type of look that's perfect for all of your fall-staple happenings, from visiting the cider mill to carving jack-o-lanterns with a pumpkin spice latte in hand. It can even transition from day to night, which is perfect with the jam-packed football weekends. I hope this gives you some inspiration to pull together an all-occasion fall ensemble like this - thanks for stopping by!